We flew with Iceland Air from London Heathrow for a 3 night trip to Reykjavik, I travelled with Regent Holidays a specialist operator to this region. We arrived to a dark snowy Reykjavik where we were spending our first 2 nights. We stayed in the Radisson Blu Saga, which is a short walk into the City, very comfortable beds, great big feather duvets that are hard to leave!! We also visited several other Hotels, Icelandair Marina Hotel was my personal favourite due to its location down in the harbour and right in the heart of things. It was very quirky, old radiators had been painted put on their side with a glass top to make a table as an example. They have a bar that I imagine at night has a great atmosphere, especially if it is too cold or snowy to go too far! We also visited the Hilton Nordica and the Icelandair Natura, the latter having a great buffet brunch. All the hotels are a very good standard, all with the same lovely big duvets, nice and warm with eating and drinking options. We had dinner on our first night down in Old Reykjavik, it was snowing and the Christmas Trees were all sparkling so quite delightful. The roads are heated from underneath by the natural hot water, snow tyres are mandatory from October to April or thereabouts. We had dinner in a Restaurant called the Market Place, with a sample menu of many different Icelandic delicacies, all very tasty. The following day we had a Reykjavik Grand Excursion. During this tour you visit all the main attractions such as The Pearl, Hallgrimskirkja church, the harbour and the famous 101 neighbourhood. Reykjavik’s unique proximity to nature, with the Salmon River Ellioaa running through it, a thermal beach at Nauthoslsvik, green valleys and outdoor swimming pools all make this a fascinating city to visit. There was an option to go on a Horseriding Lava Tour but we opted for the Whale Watching. Winter can be an exciting time to view whales and species can include white-beaked dolphins, harbour porpoises, humpback whales and killer whales. Once on board you are given waterproof clothes – basically an onesie that keeps you nice and dry and warm. We went bashing out into the big waves, being blown all over the top deck which was all great fun. Unfortunately we didn’t even see as much as a Tiddler never mind a whale! Shame! 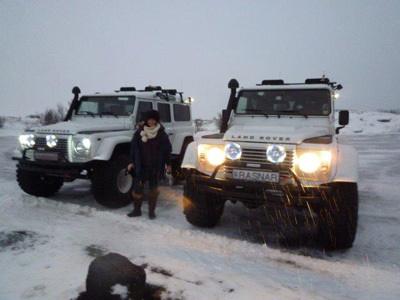 The following day we were picked up by Superjeeps, in two huge Landrovers, the tyres are nearly as high as me! I drive quite a large 4×4 but these Landrovers make mine look small, it is a bit of an art getting in and out but great fun. We set off, still dark as it does not get light until nearly 1000 hrs, on the Golden Circle Super Jeep Tour. This tour gives you the opportunity to see and experience some of Iceland’s greatest natural phenomena, geology and history. Visit the waterfall Gullfoss, the queen of Icelandic waterfalls. It is just an amazing site, it was so cold and windy and the footpaths were quite icy. I was actually blown along the path by the wind until I managed to jump into the snow!! We visited Haukadalur where you can see the geysers erupt. Strokkur is one of the largest and the most powerful geysers and erupts almost every 10 minutes soaking people foolish enough to be standing too close! We visited Thingvellir National Park where The Althing parliament was founded over 1000 years ago. Here you see how the earth is ever so slowly pulling apart along the crystal plates and stand were the Viking settlers stood centuries ago. Our adventures continued in the afternoon, we drove on seeming to get higher and more remote, it was like being on Ice Road Truckers. There were flags on either side of the road so you could see where it was. They stopped and let some of the air out of the tyres and we went off road bouncing all over the place with the snow getting thicker & thicker! We stopped in what seemed like the middle of nowhere, now in heavily falling snow. We were kitted out in more waterproof onesies, with helmets and waterproof covers for our boots and taken to our Snowmobiles. We rode off into the wilderness and stopped after about 20mins or so, on our way back it was almost white out, some of the Snowmobiles got stuck in the deep snow all adding to our adventure! We made our way back to our SuperJeeps and back down the mountain and had the nicest lamb stew ever for our very late lunch. Quite tired and weary we made our way to the Hotel Grimsborgir, 45minutes from Reykjavik for our final night. It is a haven of tranquillity set against a stunning South Icelandic backdrop. Housed in various fully equipped stylish holiday homes, the hotel’s ten luxury apartments accommodate between four and nine people each. Absolutely ideal for large families and groups, all have BBQ’s and private hot tubs outside to hopefully sit and see the elusive Northern Lights. We stayed in the new stylish hotel rooms in a separate building, with four hot tubs outside for the rooms to share. The hotel has a restaurant and bar which all the accommodations can use. We had a delicious dinner and as we had found everywhere else a really warm Icelandic welcome. I had a lovely soak in my huge bath to ease my aches after our action packed day; this bath definitely passed my ‘bathroom test’. The underfloor heating was quite a treat too for my achy feet and it was quite hard to part my head from the fluffy pillows and get out of the really comfortable bed! The following morning after a very filling breakfast, not sure how I found the space for it but I did we set off to visit the Blue Lagoon which is pretty close to the airport. The scenery as you drive through this part of Iceland is stunning, quite stark at times. 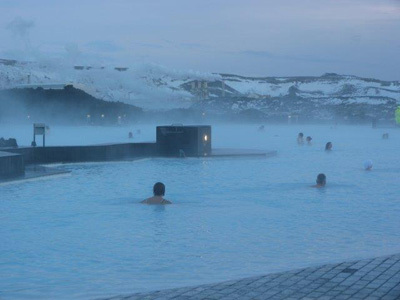 There is a hotel right by the Blue Lagoon that I used to book guest into but I don’t think I will again in a hurry as there is quite a strong ‘bad egg smell’ due to the sulphur. Having said that once we were floating about in the lovely warm bright blue water of the lagoon I can’t particularly remember smelling it then! Quite slick operations, huge changing rooms, white dressing gowns and a couple of eating options. You can bob about in the lagoon for as long as you want, you have to put the grey mud on your face I wasn’t going to risk putting it in my hair!! You can even buy a cocktail from a swim up bar! Your skin does feel really lovely after the mud treatment. So a few very enjoyable but action packed days were spent in Iceland. The Superjeeps excursion is more expensive than the coach option but I would say if you can afford it is worth every penny. The Superjeeps team are very focused on making sure their guests get the best out of their time with them, nothing seemed to be too much trouble. The Icelandic people are very welcoming and proud of their beautiful country also with the same dry sense of humour we have in the UK. It is not the cheapest place I have been to but I will definitely go back during the summer months to see more of this beautiful country.